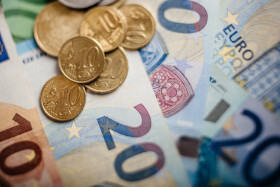 Earlier today, the euro dropped to new weekly lows following the release of the minutes of the European Central Bank‘s latest Governing Council meeting. The single currency headed lower despite the release of positive German inflation data, but rallied higher in the American session following the release of US CPI data. The EUR/USD currency pair today dropped from a high of 1.1693 to a low of 1.1649, but later retraced most of its losses. The currency pair was in a consolidative trend during the Asian session, but headed lower in the early European session following the release of German Consumer Price Index data. The German CPI data released by the Federal Statistical Office was in line with expectations, which seemed to disappoint most investors. The Eurozone industrial production data released by Eurostat beat expectations by a 0.1% margin by coming in at a monthly 1.3% and an annualized 2.4%, but could not lift the pair. The ECB monetary policy minutes dragged the pair lower as it revealed that ECB Governing Council members were split on the timing of the first rate hike scheduled for summer 2019. The release of the US CPI data by the Bureau of Labor Statistics contributed to the pair’s rally in the American session as it weakened the greenback. The positive initial jobless claims data released by the Department of Labor could not stop the pair’s rally. The currency pair’s future performance is likely to be affected by geopolitical events and tomorrow’s University of Michigan consumer sentiment survey. The EUR/USD currency pair was trading at 1.1690 as at 16:01 GMT having risen from an intra-day low of 1.1649. The EUR/JPY currency pair was trading at 131.42 having rallied from a low of 130.71.